Today we stayed at England Airport all day, doing PMCS (Preventative Maintenance Checks and Services) on the vehicles, resting, and getting ready to move out tomorrow morning. I figured out why this place is so bad for an Air Force Base; it’s not, and never was an Air Force base. At least not the part we’re staying at. Where we’re staying is a staging area for JRTC—a massive Regular Army training area. 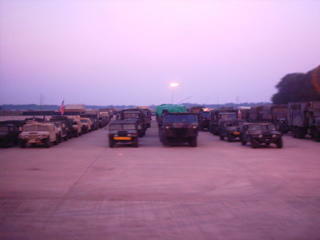 This is for Army units processing into this area for several weeks of training in the field. Everything makes sense now: The recently built but very rough buildings (JRTC moved from Arkansas to Louisiana in the last decade or two), the horrible chow (chow got a little better today), the scary PX, everything. For the Army, this is typical. That the Air Force would ever treat its people this way is almost unthinkable (wusses ☺). We’re going into the city tomorrow. Or at least some of us are. 2nd Platoon has been tasked to evacuate personnel from New Orleans. Finally! Unfortunately, I’m not going with. Although I’m in 2nd Platoon, the truck I’m driving is being used for baggage, so I and a few others have to go straight to where we’re staying. I’m pretty disappointed; this is about the most honorable mission we could get: To be the first out-of-state National Guardsmen to enter New Orleans, and help evacuate those poor people. Oh, well. I’m sure we’re going to have plenty to do. They say that they already have a backlog of missions for us, which is completely unsurprising. Frankly, I’m not sure why we didn’t move down there today. We didn’t really need a rest day. Probably there were other reasons. The place where we’re going is called Belchase Naval Base, south of New Orleans. I mention it (when I don’t normally mention destinations) because that’s where we’re going to be working out of for about the next two weeks, and if families of soldiers in the 232nd CSB need to get ahold of their soldiers in an emergency, they should contact the Red Cross and tell them where we are. We may not have any cell phone service down there, so don’t be surprised if no one hears from us for the next 10 days or so. As long as I have power, I’ll try to keep writing, even if I can’t post until later. Whenever anyone hears “south of New Orleans” they automatically think, “what, in the ocean?” We asked exactly that, but looking at a map, New Orleans is not on the south coast of Louisiana. Who knew? Our living conditions down there are uncertain right now. We will probably be living in tents, as most buildings have had their roofs blown off by the hurricane. They were supposed to get their electricity turned back on last night; no word on whether this was successful. Apparently the base is on high ground, so there’s no danger of flooding there, but we have been told to expect 2-3 feet of water in the city itself. These trucks should be able to ford that much water safely. We have been told to wear our Kevlar helmets at all times off-post, both here and at Belchase. We will have armed escorts into the city. No, we haven’t been issued weapons yet, and it doesn’t look like we will be before we go in. But someone will certainly have weapons accompanying us. We’ve been told to expect downed power lines and road signs, both hazards of different kinds. Someone congratulate me: I’ve officially been demoted three times in three days. No, this is not because of my own incompetence (at least I hope not! ), but because people from other units have been integrated with us, and several of those people outrank me. It’s only natural that they be given the leadership positions. Here’s what happened: On Wednesday I was the Platoon Sergeant of 3rd Platoon, my normal position. (I’m a Staff Sergeant. Platoon Sergeant is a position for a Sergeant First Class, one rank above me. So I was serving in a position above my rank. This is not too uncommon.) On Thursday we integrated into one platoon, and I was a squad leader (a Staff Sergeant position). On Friday we got fillers from other units, and I became a team leader under a Sergeant First Class from another unit who is serving as Squad Leader (so he is serving in a position below his rank. Team Leader is also a Staff Sergeant position, but below Squad Leader). On Saturday they got the Squad roster finalized, and it turned out that the actual Team Leader is another Staff Sergeant who outranks me (that is, he has been a Staff Sergeant longer than I), and I am in charge of a few soldiers (6) within the team, all originally from the East St. Louis or Cairo units (namely: Edwards, Samuel Young, Durer, Randolph, Cox and Schneid). That would normally be a job for a Sergeant (also sometimes called Buck Sergeant). At this rate, I’ll be a civilian before the end of the week! I don’t mind. Much. It means I sleep more, anyway. Another NCO (Non-Commissioned Officer; Sergeant) friend of mine, SSG Witt, told me today that he could tell that I had been moved down from my customary leadership position by two things: First, I wasn’t carrying the document bag (which sometimes is called by an informal and vulgar name I won’t repeat here; the Army calls it a Map Case, though I’ve never seen it used for that purpose) that I keep all my Platoon info in, and secondly, I was walking differently, more ambling along than my usual purposeful strut. I hadn’t even noticed that my walk had changed until he pointed it out to me. One more note, and then sleep: It’s interesting to me to discover that the gear that works great in cantonment (i.e. back at base, with buildings, electricity and amenities) doesn’t always work or is even needed in the field. My Palm Pilot, for instance. I utterly depend on it both in my civilian life and during Guard Drill to keep me on time and keep up with all the things I need to do. But in the field, first off I don’t have nearly the amount of things to do that can’t be done right then, so a pad of paper works much better than my Palm, and secondly the thing has turned out to be too fragile for the field. I managed to reset it because I left it in my blouse, which I wrapped around the base of the gearshift of my deuce and a half because really hot air was coming up from the engine around it. Well, I guess it overheated, because when I turned it on, it had lost every bit of its memory. Oh, well. I wasn’t using it anyway. FACT: Apparently, a female reporter from the Chicago Sun-Times is going to be embedded with us. RUMOR: 8 engineers got shot at in New Orleans while trying to repair the levee. Police fired back and shot 5 attackers.